I am delighted at how they make the effort to make a different meeple at (almost) every spin-off. The nice thing is that they also give names for (almost) every function. 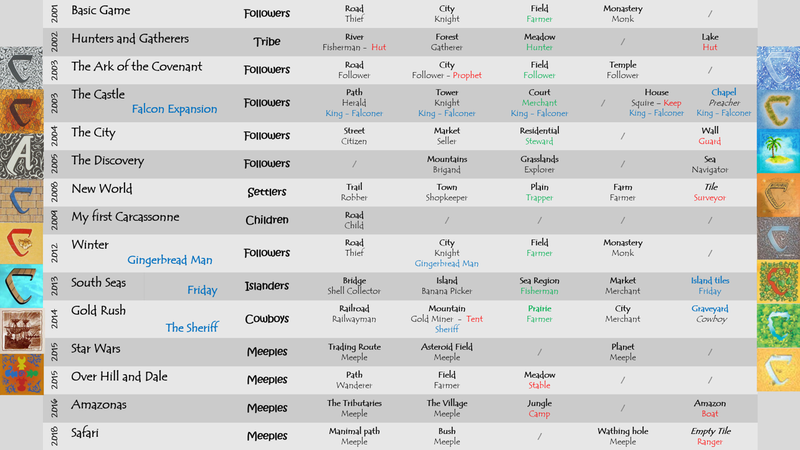 Below I have made a list with all the meeple in the game. Unfortunately, I am not so good with computers to put the figures there. Thank you for letting me know. Hopefully it is now resolved. This is cool. Something to add for the Castle are the two new types of followers from the Falcon expansion - kings and falconers. Great work Windekind, a merit from me. Thanks for sharing a great image! Thanks for the good observation jungleboy. In the meantime, the list has been updated. Thanks for the merit Decar.